Now that the Ground to Ground flyer brochure is getting out there, it’s time to provide some more detail to cafe owners about an easy way to reduce coffee waste to landfill, while at the same time helping your customers create healthier and more productive gardens. How much ‘Coffee Ground waste’ can you stop generating? The general rule is that 50,000 single espressos equal 1 tonne (2205 lb), or you can take all the dry weight of the coffee grounds you buy and double it (so if you use 30 of those 500 gram bags from your supplier each week, you end up with 30 kilos of used coffee grounds per week or just over 1.5 tonnes each year). You may be surprised by how much of these grounds you create from that humble espresso machine – the waste sure adds up. Consider the size of your bins and what you could do if you didn’t need to throw away all those coffee grounds. At the least your people would not need to carry such a heavy bag out to the bin, and I never understood why it is always the smallest guy in the shop that carries that bag anyway!? I have been fortunate in my professional life to have been mentored by some very serious process oriented people, and after enough times it becomes easy to see how the pieces fit together. When I started speaking with friends about the idea for Ground to Ground, the thought was to have all the grounds collected, stored, then eventually sold through retail stores or for commercial applications (such as in construction landfill, ETC). The problem with this approach is in the amount of energy and effort required to centralised it all. 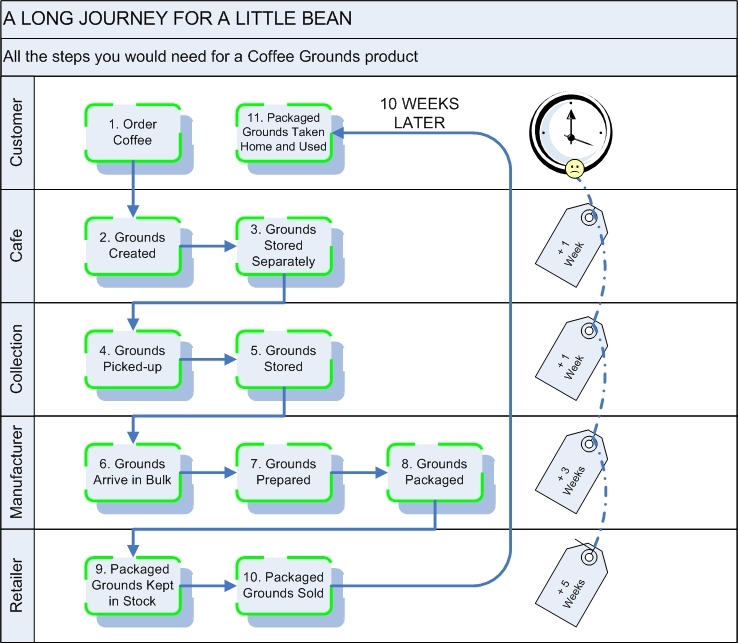 If you have a look at the chart below, it becomes clear how many steps are required to move the coffee grounds from the start to finish. Some more detail on each step is below the chart. Late, Cappuccino, Flat White, just not a Hot Chocolate! Water is forced through the dry coffee grounds at high pressure extracting the lovely crema. Then that lovely coffee cake is tapped from the portafilter into the knockbox. About 20 grams of coffee grounds are left behind each time your coffee is made. The used coffee grounds are at some point in the day, or several times, tipped out of the knockbox and into a bin or bucket. A café will generate 20 to 100 kilos of grounds per week, so may need a bin on the larger size, much like this 60 litre bin full of coffee grounds. Now the garbage/ rubbish/ environmental/ waste disposal company will come and collect the coffee grounds into an ever larger bin. I keep thinking about one of those large trucks that are expensive, have big tyres, and use lots of diesel to move around. Lots of energy to build a truck and heaps of fuel to collect lots of coffee grounds, you get the idea. The coffee grounds are stored somewhere at the collection depot. It is possible that the truck would go straight to the manufacturer but not that likely. So off it goes to a depot where it all waits to build up even more. About 2 weeks have passed by now since you had that lovely coffee. 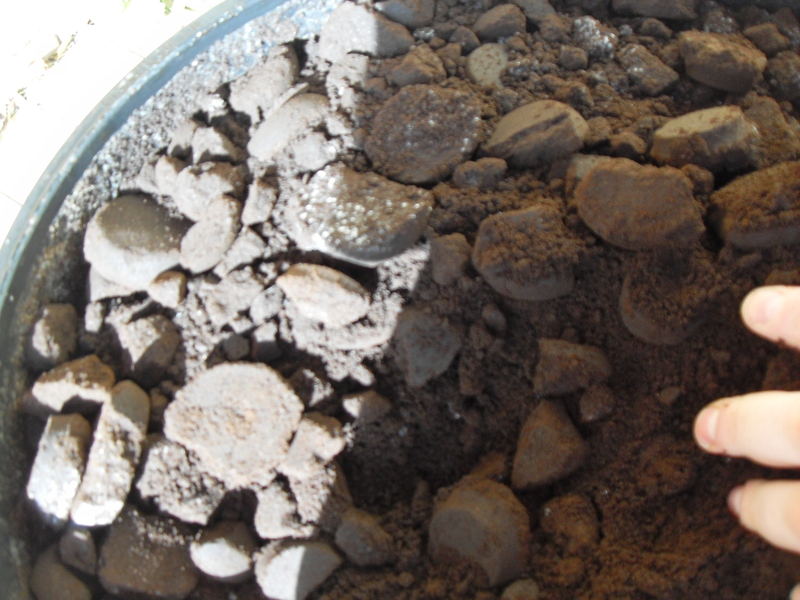 A fertiliser/ compost manufacturer will receive the grounds and prepare to process them. What they need to deal with is how to change coffee ground to fertilizer. The coffee grounds need to be dried, treated for mould (after 2 weeks if kept damp there will be mould), stored again, re-treated, then possibly mixed with other materials to form a potting mix or compost based product. You need people and energy to make all this happen, and big industrial machines. Now the coffee grounds product (or another type of product mixed from a combination of coffee grounds and other material), goes into packaging, which is almost always plastic, and gets loaded onto a pallet. The product needs a brand name, trademark, barcodes, to be actually printed on, marketing effort, and people to make all those things happen. Another big truck now ships the pallet to a retailer. The retailer holds stock of the coffee grounds product for the general public, now a good 5 to 10 weeks after your coffee was made, and that 20 grams of used coffee grounds is there somewhere in that bag. You buy a bag of coffee grounds from the retailer, and after a whole lot of storing, transporting, processing, and packaging, you get it into your car (oh my yet more fuel), for its final journey. You will use the product as an additive to the compost pile or compost bin, for the vegetable patch, the worm farm, to sprinkle over the lawn, or to put onto the pavement to deter snails and slugs (and ants and cats!). So now let us have a look at all the steps required to give the coffee grounds out directly from the cafe. As you can see below, there are so few steps we don’t need to go into any detail, only to say that the whole thing will take about 10 minutes, and you can take your coffee grounds home while the coffee cup is still hot. Following the steps below will save a great deal of energy against any other form of processing the coffee grounds, which means a lower environmental footprint, and that is a smarter way to do business. The most effective way to do this is to have a plastic bag in the knock-box cylinder. Once the bag is full, one of the best natural soil additives on Earth is ready to hand out. They can store for a couple of days in the bag without too much trouble, and I’m confident that if you let your customers know that the coffee grounds are available, one or more of them will gladly take it off your hands. Tags: cafe, coffee house, composting coffee grounds, shop. Bookmark the permalink. Shane: could it be possible to dry out the coffee grains in a food dehydrator or in the oven and put in paper lunch sacks for give away at the cafe? Would the added heat take away any of the nutrients? I am wanting to do this in my start up “healthy” cafe and think it would go over well. Just wondering since your article says Starbucks does this, but I’ve never seen how they package them, etc. Please advise. We are joining this brilliant initiative …… @ambrosiacafe in Berwick, Victoria Australia!!!!!! commencing Friday ! I’ve added you to the map, and if you need help with anything at all please let me know. You sure can Tracy, and it is so good to see you here on the site. I’m getting a heap of interest coming out of the UK right now, and we have strong representation in London with Deborah Rothenberg. Dorset looks like a magical place and you sure can help us make a difference. Looking forward to seeing how it works out for you and please let me know if there is anything I can do to help. Can you help me with some advice for when the coffee knock box goes mouldy? Best advice there is to clean it out more often. The combination of moisture and heat will start to break down those grinds almost immediately. Just wanted to congratulate you for this initiative. As a cafe owner, I’m finding it helps to reduce the number of bins I need to order, and the few customers that know about the collecting coffee grounds thing are right into it. Sometimes they get upset with me when there is no more for them to take! Keep it up and best of luck with getting other cafes, I tell them whenever they ask can coffee ground go into compost. Super news Trevor. Always happy to hear from a cafe about saving coffee grounds. It certainly makes it easier for people to know where to buy used coffee grounds – you don’t need to!! Please let me know if you need any more info and all the best with it. Thanks sis – cafe compost is the future dude. Why throw out organic material that gardeners can then turn into compost for their soil and plant health?